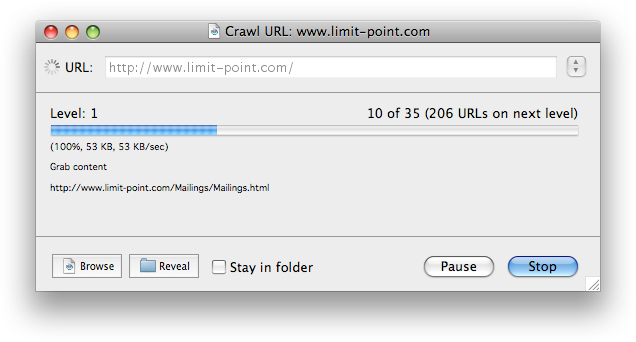 A Mac app for downloading web sites. Blue Crab Lite is an app that downloads web sites, including linked content like images, sounds and movies, to your computer. What can Blue Crab Lite do for me? Create complete copies of websites on your computer for offline browsing. Search web sites on your own computer. Once a website has been downloaded to your computer you can use the built-in search engine or Spotlight to search it. Blue Crab Lite downloads not only the pages themselves, but all the resources they reference such as pictures. Files are always downloaded into the "Blue Crab Lite" folder of your Documents folder. A subfolder named after the wesbsite is created here, along with an alias that points to the page for the starting URL. Use the "Reveal" button to get here quickly, and the "Browse" button to open the page that corresponds to the starting URL. 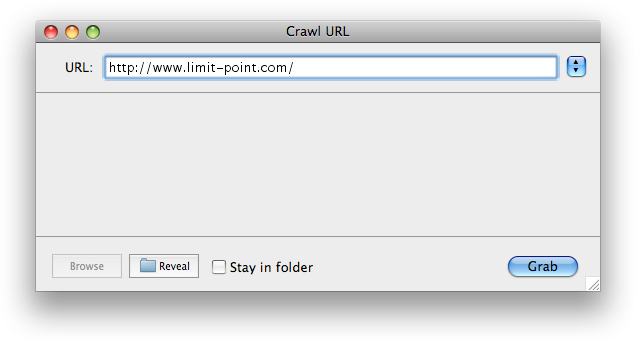 You can restrict the breadth of the crawl by using the "Stay in folder" option. When you do so the program will only download URLs whose path begins with the path of the starting URL.